SAHUARITA, Ariz. – Once again, the Green Valley Pecan Company was recognized by the British Retail Consortium (BRC) for high standards in food safety with an AA Rating. As the first pecan processor in the world certified by BRC, Green Valley Pecan Company continues to be a leader in food safety practices and has maintained this certification every year since 2009. Green Valley Pecan Company was audited for this certification in June 2018 and was issued the certification on July 10, 2018. 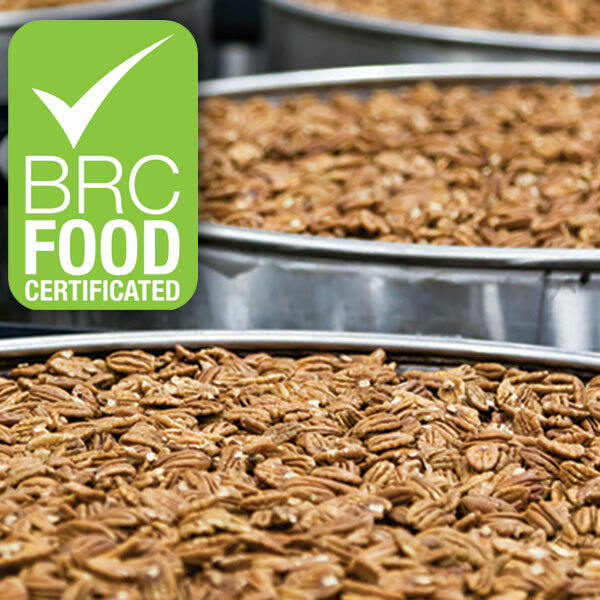 BRC certification assures customers that Green Valley Pecan Company products are safe, legal, and of high quality. BRC was founded in 1996 by retailers who wanted to harmonize food safety standards across the supply chain. Today, BRC is globally recognized across both food and non-food categories, and it operates the most rigorous third-party certification scheme of its type. BRC Global Standards guarantee the standardization of quality, safety, and operational criteria and ensure that manufacturers fulfill their legal obligations and provide protection for the end consumer. BRC Global Standards are now often a fundamental requirement of leading retailers, manufacturers and food service organizations.